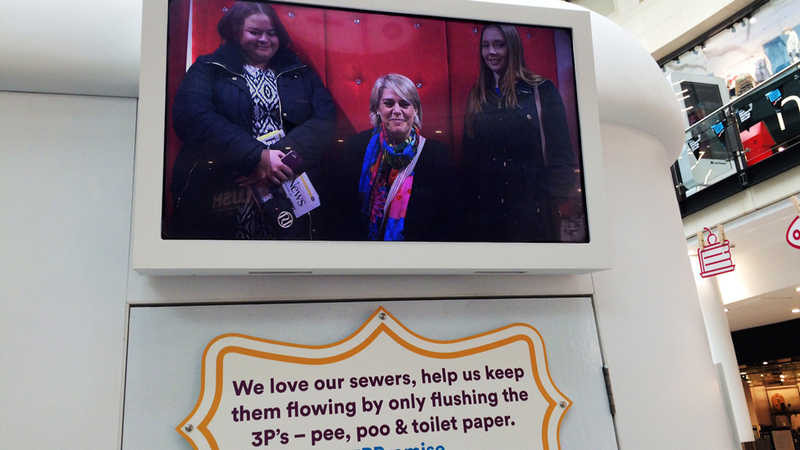 To raise awareness of an ongoing issue clogging up local sewers, we designed an experiential marketing space to face the problem head on. 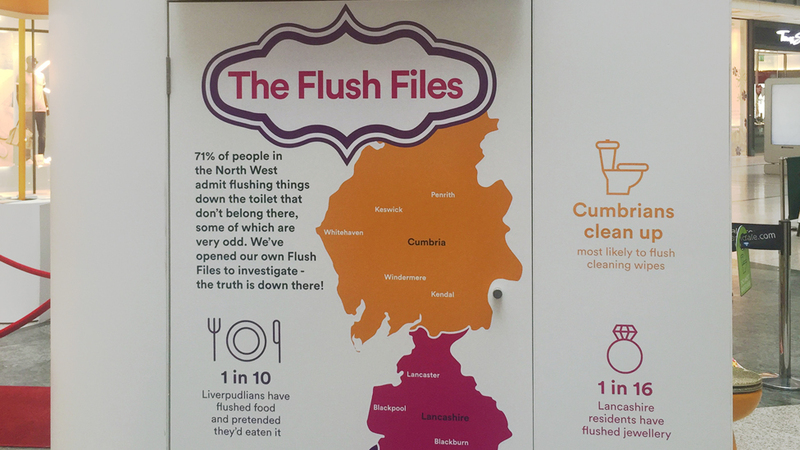 71% of people in North West England admit to flushing things down the toilet that don’t belong there. 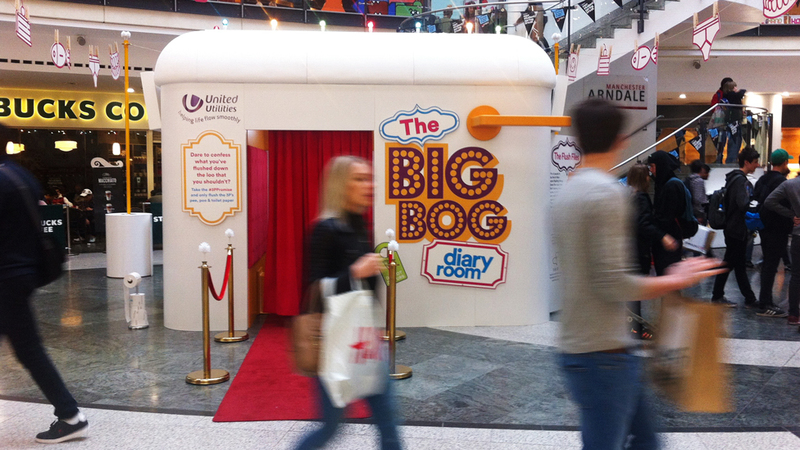 To raise awareness, United Utilities chose one of the largest urban shopping complexes in the country – the Arndale Centre, a busy hub in the vibrant city of Manchester visited by locals and tourists. The venue has a catchment population of 6.7 million people, with 42 million footfall annually. However, with 249 retail units to distract our audience and less than 2 hours average dwell time, we had to ensure the space captured visitors’ attention and encouraged them to engage with it. 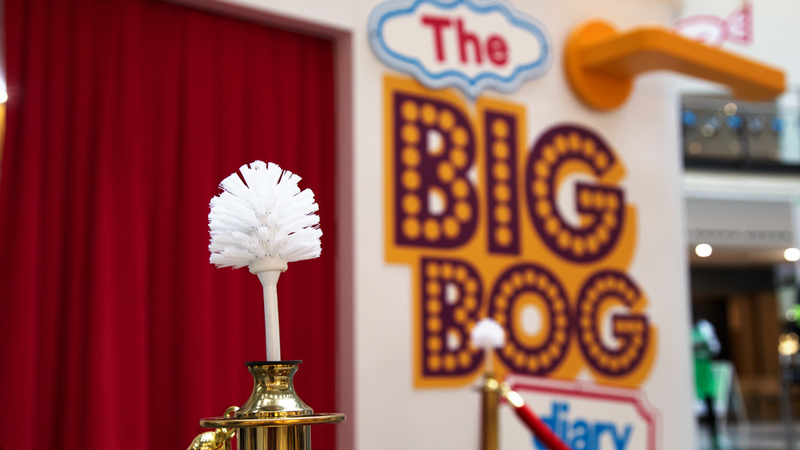 The idea of consumers confessing their “loo sins” was born. United Utilities’ research had revealed the many unusual items people flush down their toilet, including false teeth and deceased goldfish. The design presents a serious, and sometimes unpleasant, issue in a colourful and fun wrapper. Friendly event staff invite passers-by to reveal all and confess their loo sins in a private booth ‘toilet cistern’ whilst sat on the Golden Toilet. After drawing a luxurious red velvet curtain, excitement and a feeling of mystery are heightened by a friendly but authoritative voice encouraging people to share their confessions on camera. 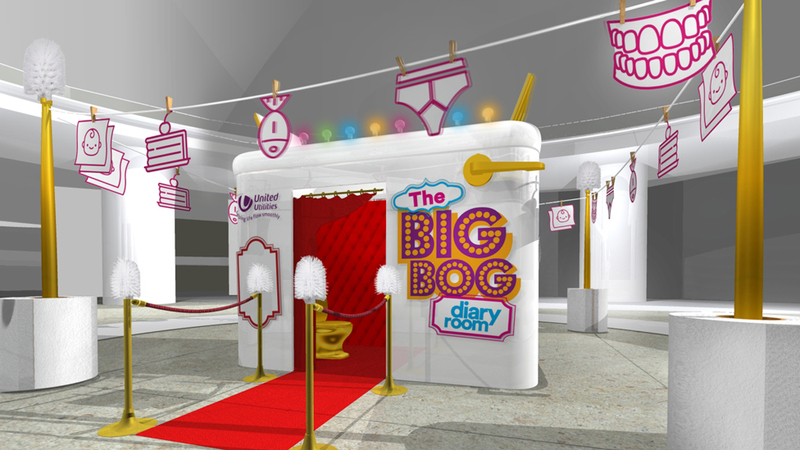 The loo confessions are being simultaneously broadcast live onto the big screens outside the Diary Room. 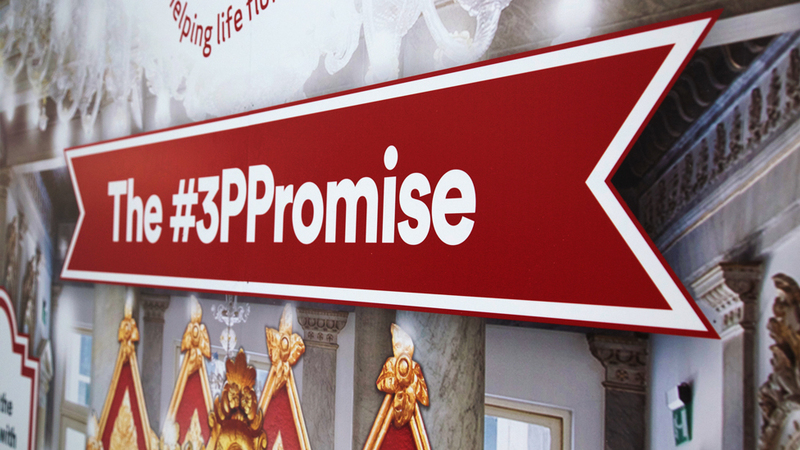 This generates interest from other passers-by, and clear calls to action on the stand encourage people to share the experience on social media. The experience is split into two clearly defined areas, the Diary Room and a Golden Toilet area round the back where people take selfies. 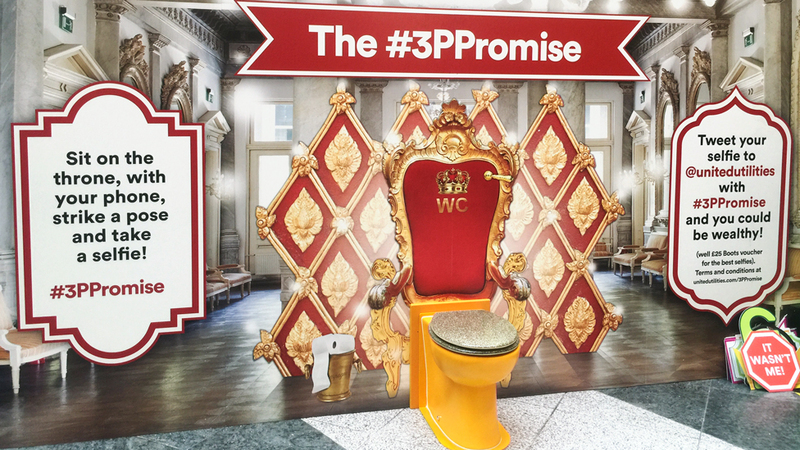 The inclusion of hand-held props adds even more toilet humour and further contribute to the social media sharing frenzy. Both spaces play with the idea that something as intimate as sitting on a toilet and an individual’s toilet habits are then turned into a public event, where a mixture of fun and subtle embarrassment make the experience truly unforgettable, encouraging action and change in people’s habits. 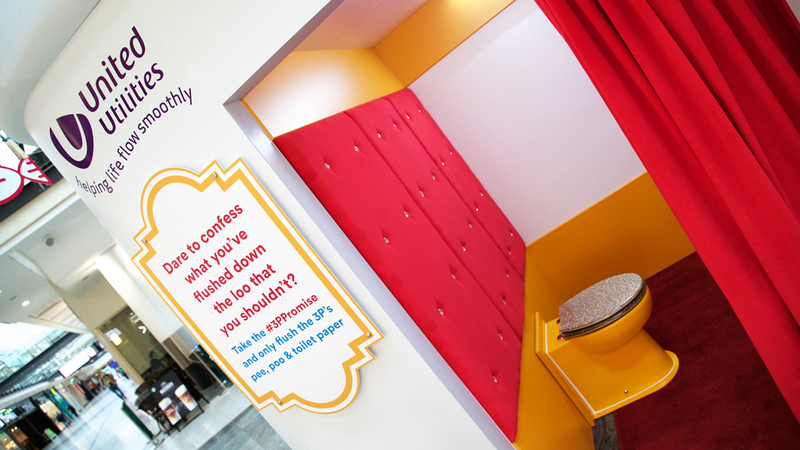 People were also invited to confess their ‘flush blush’ on specially created toilet roll notes, which they could then stick to the confession booth for extra interest, as well as being useful research data for our client. Suddenly going to the toilet is fun, but the underlying serious message is never forgotten. 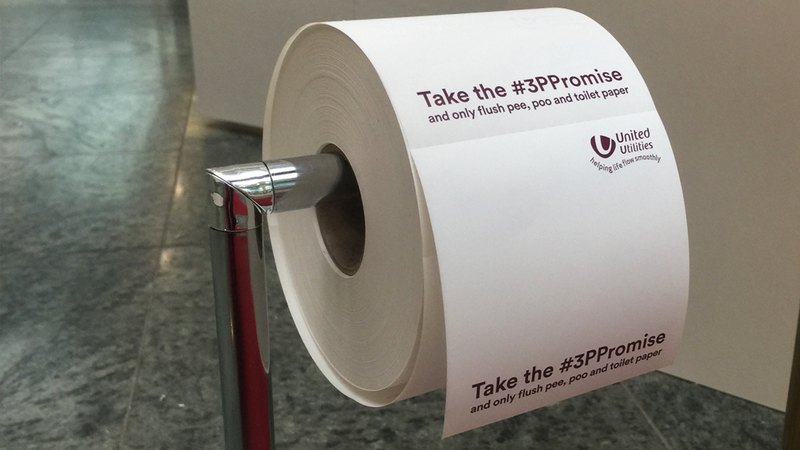 The branded toilet rolls were given away to all those who shared their confessions as Thank You. 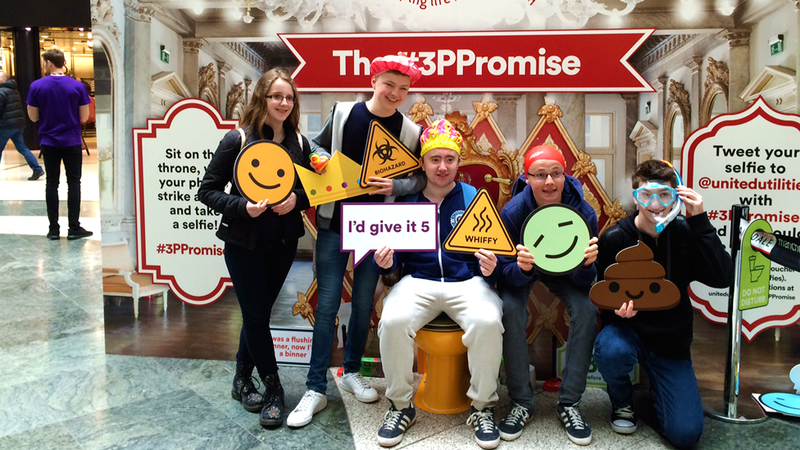 Playful and colourful props helped maximise visibility in the busy shopping centre, ensuring effectiveness of the experiential marketing space. 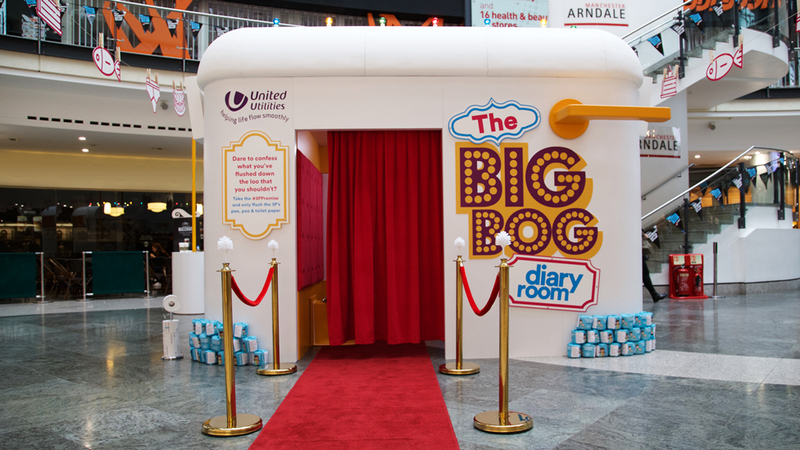 Large toilet roll poles mark out each corner of the experiential marketing space, with red carpet included. A washing line strung from corner to corner features icons of naughty flush items secured by oversized washing pegs. “The team at Parker Design exceeded our expectations once again, and they really helped us stand out from the crowd, literally! The fun design played a major part in helping us bring a very serious issue to the surface in a really engaging way. Passers-by wanted to join in and confess their “loo sins”.